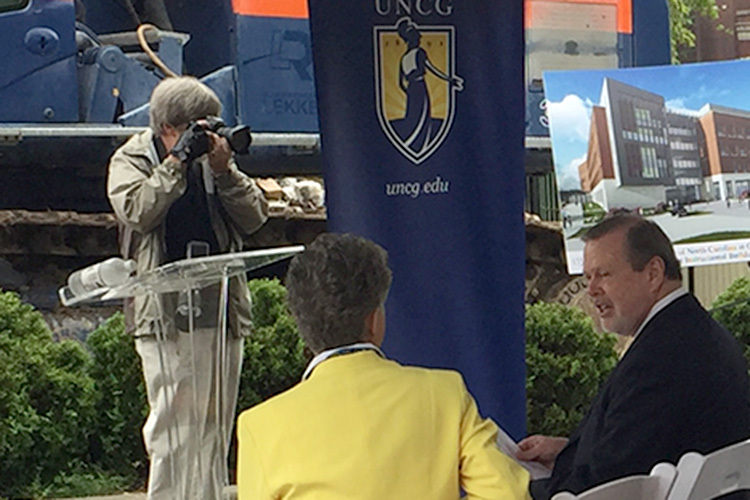 The University Communications Photography Department creates images that tells the UNCG story. Our imaging specialists work in an editorial and documentary style. The still and motion photography sets the standard for outward facing university communications, our work supports a wide variety of UNCG publications, multimedia and online communications. Our still photographers provide a variety of imaging services to the UNCG community. Due to the limited availability of our photographers, we request that assignments be reserved for situations that are outward facing and help further the department, school and university’s mission and message. Note: In some circumstances, photography requests may be outsourced—in these cases, subsequent costs incurred will be the responsibility of the requesting department or office. Please allow sufficient time (ten or more business days in advance) whenever possible. Please allow at least ten working days for delivery of photographs to the online archive. University Communications photographers do not assist with photography for classroom instruction or research. However, UNCG Online is available to provide academic media support services. For further information, contact Daniel Smith, creative services coordinator, (336) 315-7030. University Communications has contracted with Micciche Corporate Photography for professional portrait photography services. The portrait session will provide standard studio lighting and a tasteful gray background. Portraits are made at Micciche Corporate Photography located at 3719-c West Market St. in Greensboro. Just two-and-a-half miles from campus, Micciche Corporate Photography offers in-studio portrait sessions for UNCG faculty, staff and students every Monday, Tuesday, and Thursday with appointments available from 8 a.m. to Noon. To schedule an appointment with Micciche Corporate Photography, please visit Micciche Corporate two weeks prior to the desired appointment date. Be sure to include your department/unit name and funding code in the “messages” field and select the “University Portrait” option. A portrait photography studio sessions cost $75. Portrait sessions will be billed from UNCG University Communications to the department/unit the individual is affiliated with at the university. Appointment cancellations communicated to Micciche Corporate Photography less than 48 hours in advance of the scheduled appointment will be charged for the session. For information on additional Micciche Corporate Photography policies visit http://www.miccichecorporate.com/services. University Communications will receive and keep your photograph in our archive for university use such as press releases. To schedule an appointment with Micciche Corporate Photography, visit Micciche Corporate two weeks prior to the desired appointment date. Be sure to select the “University Portrait” option and note you are a UNCG student in the “messages” field. A portrait photography studio sessions cost $75 plus tax. Before scheduling a portrait session, check with your academic department to determine if the portrait session will be your financial responsibility or that of the academic department. Appointment cancellations communicated to Micciche Corporate Photography less than 48 hours in advance of the scheduled appointment will be charged for the session. For information on additional Micciche Corporate Photography policies visit http://www.miccichecorporate.com/services.